The Indian designer DC Design is working on a new concept based on Dacia Duster. The concept will have a futuristic look, LED lights and a new front grille. Dacia Duster has the reputation of the cheapest SUV in the world, but is also a source of inspiration for the automotive designers, like the Indian design studio, DC Design. The Indian studio has published a teaser that announces the new concept based on Dacia Duster, that is sold under the Renault logo in India. The aim of the Mumbai body builder and designer is to create a futuristic interpretation of the Romanian SUV. 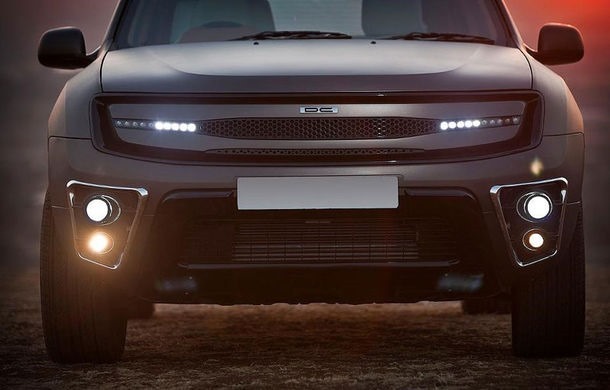 The first picture shows the Duster concept dominated by masculine lines, chrome and discrete LED lights. The overall design seems to be inspired by the Renault DCross concept presented last year by the French car manufacturer at the Auto Show in Sao Paulo, South America. Although the name is still a mystery, the Indian Duster Concept promises to be a source of inspiration for the Dacia and Renault designers, who are currently working on finalizing the facelift for the Dacia Duster. The Dacia Duster facelift should be officially unveiled this autumn, at the Frankfurt Motor Show.